FORT WORTH, Texas — Just one week after suffering an upset loss, No. 8 TCU is sitting pretty once again and feeling good about its championship prospects. 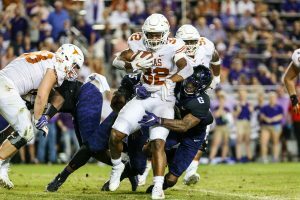 The Horned Frogs disposed of Texas 24-7 behind a stifling defense Saturday night at Amon G. Carter Stadium to set up another heavyweight clash. TCU (8-1) is at No 5 Oklahoma (8-1) next week with first place in the Big 12 and the conference’s upper hand in the race for the College Football Playoff on the line. The Frogs and Sooners are both 5-1 in league play. Kyle Hicks ran for two touchdowns and quarterback Kenny Hill accounted for 189 yards for the Horned Frogs. Hill completed 18 of 26 passes for 146 yards and ran for another 43 yards on 12 attempts. But TCU’s 17-7 lead at halftime was more than enough cushion for Patterson’s quad to bounce back from last week’s loss at Iowa State. The Horned Frogs did get a late rushing touchdown from Darius Anderson (99 yards on 18 carries) to put the game away. The 17-point margin was the biggest loss for Texas in coach Tom Herman’s first season. “Hats off to TCU. That’s a really good football team,” Herman said. “I think it was very evident that you saw the two best defenses in our conference battle it out. From my perspective, the biggest difference was, early we gave up a couple big plays. Texas quarterback Shane Buechele started for the second straight game with true freshman Sam Ehlinger inactive. Buechele, the starter last season and in this season’s opener, threw for 254 yards (21-44) and a touchdown, but was sacked seven times. “There’s a lot of things we’ve got to do better in order to give our guys a chance,” Herman said. TCU has not allowed a touchdown in 13 of its last 16 quarters.